This tutorial is about how to use Pavtube BDMagic to convert Blu-ray title to AVI for playback with specific modern portable media player. Please follow me step by step. In the past, if you want to preserve your hundreds of Blu-ray discs, it may take you the space of a whole shelf. Now to clean up your Blu-ray collection and get them freely playback on any modern portable media player, ripping Blu-ray to AVI format should be the right thing to do. So today I am here to give you guys the one-stop solution to convert Blu-ray to AVI with original video quality. For those who would like to realize the ripping process, Pavtube BDMagic will be your best option. (Here is review) It enables you to remove Blu-ray protections and then rip Blu ray to AVI format, which is playable on majority of PC media players, with keeping most razor-sharp image. Besides AVI, users may use it to convert their Blu-ray to other formats like MP4/MOV/MKV/WMV/MPEG, and to play on other devices as well. Now I will show you the full guide on how to convert Blu-ray to AVI with High Quality and Fast Speed. Check out. Install and run the ideal Blu-ray to AVI Converter(For Mac users, BDMagic for Mac will do a great job). Simply click the "Load BD" button on program toolbar to load Blu-ray movies from disc or computer. All imported Blu-ray movies could be previewed on program right viewing window. Tip: All titles of the original Blu-ray movies could be seen on program left panel. And in every title, you can see various chapters. Just check the titles or chapters you want to rip. To convert Blu-ray movies to AVI with subtitles contained, just simply click “Subtitles” and select the one you prefer. Tip: You can also choose to rip Blu-ray with forced subtitles if you don’t want to have extra subtitles on screen for your native language. 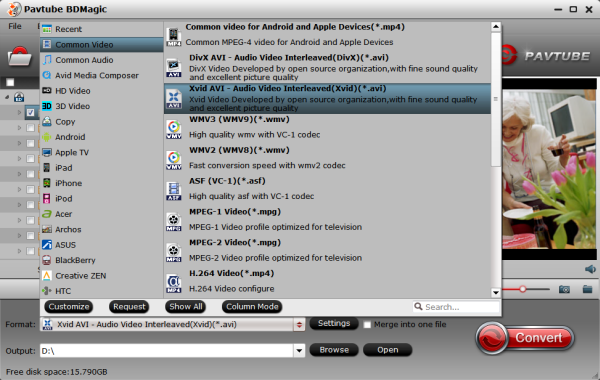 Select “DivX AVI - Audio Video Interleaved(DivX)(*.avi)” as output format from “Common Video” category under the drop-down list of “Format”. If you want to get better HD video quality, choose “AVI HD Video(*.avi)” from “HD Video” category as the output format for playback on any modern portable media player. As all settings are done, you can click bottom-right button "Convert" to start converting Blu-ray to AVI. The time that it takes Depends on your source movie quality and Movie Length. And thanks to its built in Nvidia CUDA and ATI stream accelerate technology. Makes the conversion speed at least 6X faster than common conversions. When the task is done, click “Open” button to find the result movie file. Then, you can grab a top AVI player and view Blu-ray titles in modern portable media players. Of course, the lossless quality is ensured on output files. In addition to Blu-ray playback, you can also get Blu-ray for editing in your Premiere Pro freely. Moving from Blu-Ray ISO to MKV - What to expect?